Hungry for More? Turkey Tetrazzini - The Let's-Keep-This-Party-Rolling Leftover Fave - Katy Keck: Palate. Passion. Purpose. Are you full yet? I know. I know. The mind reels that we are still talking about food. But trust me – this dish does not disappoint. And, be honest. Turkey sandwiches start to feel redundant. Turkey Tetrazzini, a dish I grew up on, however is creamy, hearty, and full of mushroomy goodness. My mom found her recipe (very, very loosely translated below, in part because 50 years ago directions were vague and ingredients were more a suggestion when “the homemaker” already knew how to cook) in the 1968 Panhellenic Meats Cookbook. “Every home should have a good meats cookbook. This cookbook is filled with wonderful recipes submitted by sorority members over the nation. Here you will find all sorts of mouth-watering meats – from tried-and-true favorites such as hamburger pie to exotic foreign treats.” These gals surely got around because despite foreign dishes starting off with lasagna and Canadian meat pie, they also ranged from Turkey to Taiwan to Tahiti. Speaking of the 60s…who’s doesn’t like a good road trip to pick out dinner? I’ll take THAT one! Tetrazzini was invented in a hotel (debates over whether it was San Francisco or NYC) in the early 1900s. Opera star Luisa Tetrazzini is its namesake. There is seemingly no standard for what ingredients are required, but it generally includes poultry, a cream sauce and long thin pasta. The Meats Cookbook recipe may or may not call for sautéing the onion in bacon grease. I am not sure I can in good conscience call for that. And I’m here to assure you that I always choose the healthier EVOO. But you should know that is probably a lie. It is definitely a lie. It’s your cholesterol. Do what you will. For goodness sake, it’s the day after Thanksgiving. Is this really the time to show restraint? 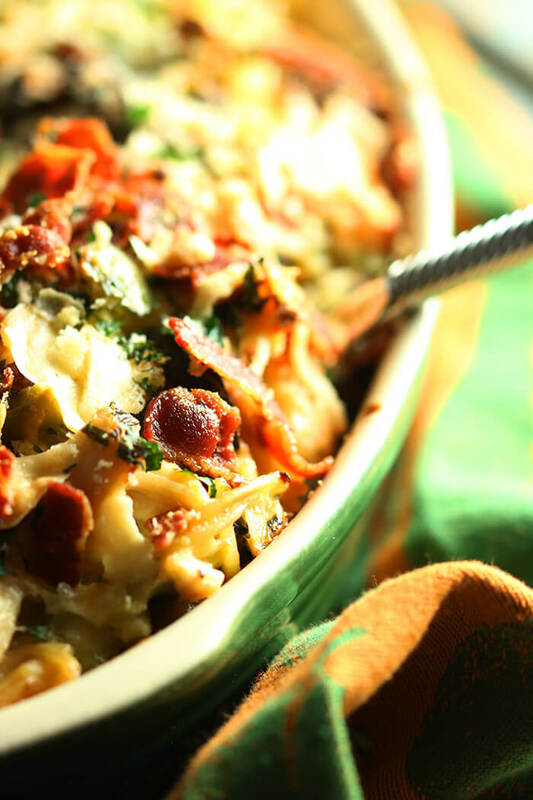 Instead of talking turkey, let’s just let the Tetrazzini do the talking! Preheat the oven to 350oF. Butter a 9x13x2-inch 3-quart casserole. I’m switching it up here and making a cross between a milk-based Béchamel white sauce and a chicken broth based Velouté. That makes it creamy and also a bit lighter. Start by making a roux, using 3 Tablespoons each of butter and flour. Melt the butter and whisk in the flour to make a roux the texture of wet sand. Let it start to bubble and continue for one minute. Whisk in the milk and chicken stock. Combine well. Season with salt and pepper. Add the celery and peppers and simmer for 15 minutes until thickened, whisking from time to time to make sure the sauce does not stick, and the vegetables are softened. Meanwhile, add 1 Tablespoon of the remaining butter (or the bacon fat if using) to a sauté pan and add the shallots. Sauté until golden and a bit crispy, about 8 minutes. Drain on a paper towel. Add an additional 2 Tablespoons of butter to the pan and sauté the mushrooms until browned. Cook the pasta according to package directions, under-cooking by a minute or so. Drain. In a small bowl, combine the parsley, shallots and Parmesan. In a large bowl, add the pasta, turkey, mushrooms, cheddar, and gradually add the sauce, folding to combine evenly. Add half the parsley/shallot/Parmesan mixture and toss well. Transfer to the prepared casserole dish. 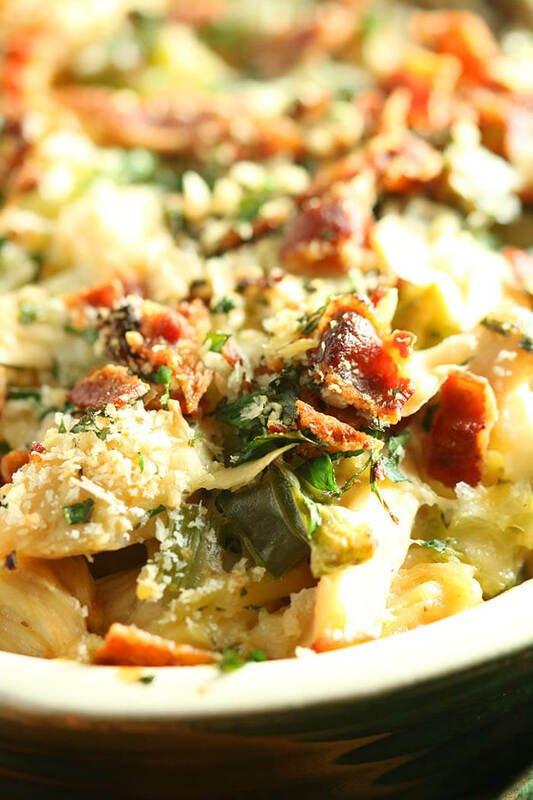 Top the pasta mixture with the remaining parsley/shallot/Parmesan mixture and sprinkle with the bacon and breadcrumbs, dotting with 1 Tablespoon butter. Bake in preheated oven for 45 minutes until bubbly. Serves ??? How much do you love this? At least 6 or 8, and more if you are willing to share. © Copyright: KatyKeck.com 2016. All rights reserved. Hey, we want to hear from you! Don’t forget to Comment, Share & Subscribe to our blog. I have never not-fried celery and green peppers so the idea of cooking them in the béchamel took just a tad of nerve. I used the biggest bowl in my kitchen to mix it all thinking it would never fit in the 3 quart baking dish. Let me just say (wait a moment there are tetrazzini strings hanging from my lower lip) that this is the best day-after turkey I have had in my entire life. Thank you Katie, another giant win. Holy tetrazzini, this is heaven. Yeowza. Adding the celery and pepper to the béchamel is one of the original directions. I left that in tact because I think it adds a nice veggy infusion to the sauce. Thanks for taking the leap of faith! And glad you are as smitten as I! Love that you don’t use cream of mushroom soup. I have cut out a lot of processed foods due to my son’s migraines. Agreed – avoiding processed and gobs of sodium is always win win. Katy!! I just Love reading your blog….you share such endearing great stories/memories of your life!! The easy bake oven success was impressive!! I never did so well!